southern orders : OKAY, I ADMIT IT! 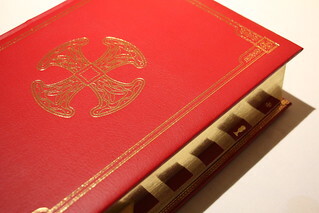 I AM JEALOUS OF THE NEW "DIVINE WORSHIP: THE MISSAL!" WHY OR WHY, IN THE NAME OF GOD AND ALL THAT IS HOLY DOES THE ANGLICAN ORDINARIATE OF THE CATHOLIC CHURCH HAVE A MISSAL FAR, FAR MORE SUPERIOR THAN THE STANDARD ORDINARY FORM OF THE MASS? IT MAKES NO SENSE UNLESS OF COURSE IT IS PREPARING THE WAY FOR US TO RECEIVE A SIMILAR MISSAL IN THE NEAR FUTURE! OKAY, I ADMIT IT! 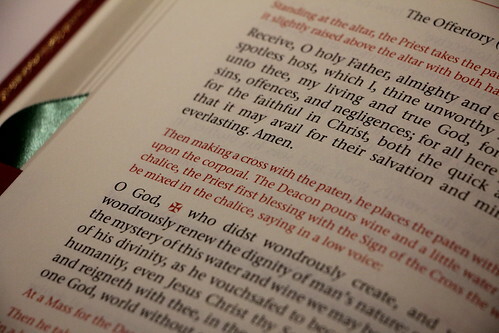 I AM JEALOUS OF THE NEW "DIVINE WORSHIP: THE MISSAL!" WHY OR WHY, IN THE NAME OF GOD AND ALL THAT IS HOLY DOES THE ANGLICAN ORDINARIATE OF THE CATHOLIC CHURCH HAVE A MISSAL FAR, FAR MORE SUPERIOR THAN THE STANDARD ORDINARY FORM OF THE MASS? IT MAKES NO SENSE UNLESS OF COURSE IT IS PREPARING THE WAY FOR US TO RECEIVE A SIMILAR MISSAL IN THE NEAR FUTURE! While I cry that we in the Ordinary Form of the Latin Rite don't get this new Anglican Ordinariate Missal or a facsimile of it for our use in the Ordinary Form, it is a forerunner of what we will eventually get because Divine Worship: The Missal shows the influence of the Extraordinary Form on the Ordinary Form although it has some Anglican influences as well. It is what Pope Benedict desired: Mutual Enrichment and it is the way for us for the Reform of the Ordinary Form of the Mass. 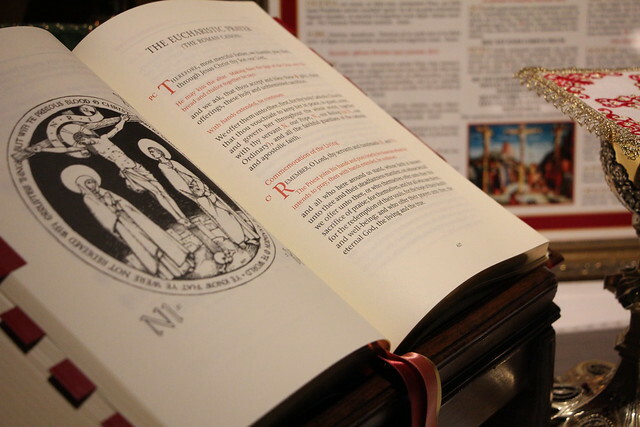 This new missal shows us the way and is here for part of the Latin Rite, the first Missal revised after Vatican II that is in continuity with the Missal prior to Vatican II. This is groundbreaking to say the least! On top of that they get a "sacral" English with "thees and thous!" The Ordinariate gets the Prayers at the Foot of the Altar back! We don't! It isn't fair! Please note how this new Missal which goes into affect this Sunday, the First Sunday of Advent, formats the Introit! The Introit is arranged in the Missal itself. Although in English, it is the same, exact same, format for the Introit as in the Extraordinary Form to include the Refrain, Verse, Gloria Patri, and repeat of Refrain and it isn't called the Entrance Antiphon but the Introit! Please not too that they get Sundays after Epiphany and Sundays after Trinity (Pentecost)! They get most of the rubrics of the EF Mass back, including kissing the altar each time the priest turns away from it! It isn't fair that we don't get this in the Ordinary Form! 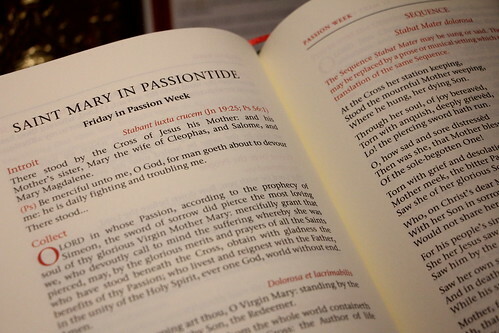 And Passiontide explicitly returns to the Missal while the Gloria Patri disappears the last two weeks of Lent as in the 1962 Missal. It makes my heart flutter! Of course it is also omitted in the Requiem Mass! They get Septuagesima back! It's just not fair! I want to cry for joy! 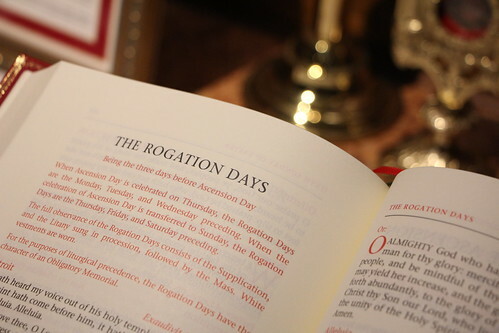 Rogation Days are explicit in the new Missal! But I cry in sadness for the rest of us who don't get it! Ember Wednesdays return no less! Why or why them and not us? 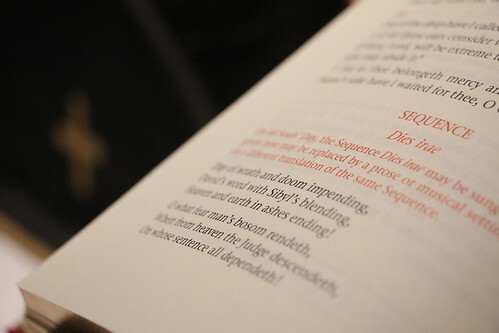 Adding insult to injury, it is clear in this new missal that the Gradual and Tract may be used on Sundays and in the Requiem Mass the Dies Irae returns as the Sequence to its proper place (completely expunged in our OF Missal!) It isn't fair, they get it! We don't, at least not yet! Boo Hoo! They even get the EF Offertory Prayers with the EF Rubrics, but now we in the Ordinary Form are mere step children to this superior Missal. Why them and not us I ask in shaking voice! The rubrics from the EF Mass are allowed for the Roman Canon. Please note the rubric (He may kiss the altar) after the beginning of the Roman Canon! I ask is this fair that they get it and we don't? I am having a stroke! See all the glorious unfair pictures HERE and HERE! The First Sunday of Advent will see the introduction of a new missal in the Catholic Church, one that has been in preparation for five hundred years. 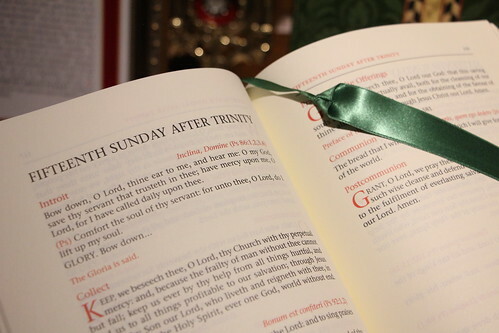 Known as Divine Worship: The Missal, it has been handsomely published by the Catholic Truth Society to serve the communities and parishes of the personal ordinariates —structures similar to dioceses, established to provide a home in the Catholic Church for those from the Anglican tradition. 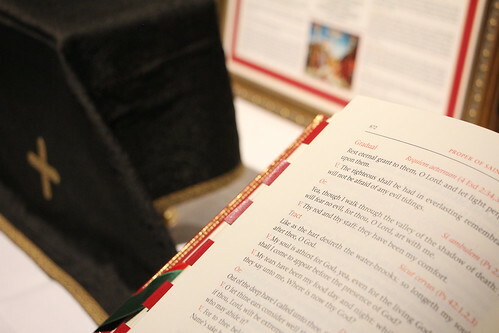 Divine Worship: The Missal obviously didn’t really take five hundred years to prepare, but it is the product of the prayers of almost half a millennium. It represents, in a very real way, the fruit of the sacrifices made by Catholics during the so-called Reformation, and embodies the longed-for unity of Christians articulated by the documents of the Second Vatican Ecumenical Council. This principle is at work in Divine Worship. Our distinctive liturgical life in the personal ordinariates is at once a sign of that legitimate diversity, and of a tradition which has been grafted to the vine from which it was so brutally severed—the rock from which it was hewn (Isaiah 51:1). 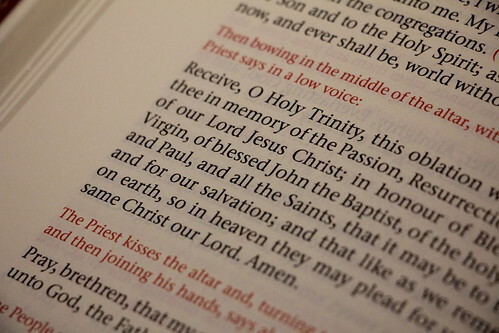 That is to say, this new missal is a fruit of our prayer for Christian Unity. It is what Pope Benedict called, “a prophetic gesture … [that] sets our sights on the ultimate goal of all ecumenical activity: the restoration of full ecclesial communion.” The introduction of Divine Worship, then, represents a hugely important moment in the life of the communities of the personal ordinariates, as we seek to implement in an authentic way the vision set before us by the Church and for which we have prayed for so long. It is also a moment of historic significance for the whole Church, as the liturgical patrimony of Christians from a community forged in the crucible of the Protestant Reformation is refined and repatriated to the fullness of Catholic communion. All Catholics can rejoice in this work and support us in this task: Visit our communities! Get to know our people! Come and experience our worship! Above all, continue to take up the Lord’s challenge given on the night that he was betrayed, to pray that all may be one in him, that the world might believe (John 17: 21). Father James Bradley is a Priest of the Personal Ordinariate of Our Lady of Walsingham, and a graduate student of Canon Law at The Catholic University of America, in Washington, DC. The English Mass we should have had. If I did not have an Traditional Latin Mass to attend, I would attend the Ordinariate in Toronto without any hesitation. While I could not "transfer" officially, I would in all practicality. Sadly, it is only on Sundays and at 4:00PM! Good grief, you'd think they were Latin EF Catholics to be treated so. I do hope we will get something like this in the ordinary form. Maybe something exactly like this. I'm with you, Father. I hope the OF can eventually go this way. If former Anglicans can get these great elements of our patrimony, cradle Catholics should be able to, too. I'm sure it would be possible for your congregation to convert en masse to Anglicanism, and then join the ordinariate when converting back. With careful planning, it could all be done within the space of one mass. Either that or you'll have to get one of those backstreet Anglican ordinations and re-convert when a suitable post comes up. Both this translation of the Roman Canon (more so) and the 2011 ICEL version (somewhat less so, but still genuinely) put the first ICEL translation of it to absolute shame. I really don't know how that original translation got approved. It completely neutered the prayer and rendered it basically unrecognizable. I attend the TLM exclusively, however I have always said the High Church Anglican Mass is MORE Catholic than the modern Novus Ordo, how ironic is this? I have attended High Mass in a Anglo-Catholic church and let me tell you it was stunning, incense, Gregorian chant, Latin motets, kneeling for Holy Communion, Roman fiddlebacks, you would have thought you were in pre-reformation England, it brought me to tears what our Church should have been like after Vatican II. Not sour grapes, but I do feel distinctly uncomfortable with this Missal, since the language suggests it was designed to satisfy the needs of ultra-conservative, nostalgic Anglicans, not Catholics. I've attended High Church Anglican services on occasion too, like anon 10.06, and all the quasi-Catholic accoutrements just seemed to me like a weird form of play-acting, lacking the organic necessity of the TLM. And should the Church be squandering resources on the ordinariates when they've manifestly failed as a vehicle for the New Evangelization (the numbers of converts involved are tiny: so low that the ordinariates won't reveal what they are). While it is true that Catholics cannot become full members of The Ordinariate unless they have some recent Anglican heritage, they can certainly become parishioners of Ordinariate churches. In fact, I am considering doing just that with my family, since the Ordinariate's Divine Worship is so far superior to any Novus Ordo liturgies in our diocese. Do you think this is why Pope Francis put Cardinal Sarah in his place at the CDW, to help implement the options the Anglican Use has into the OF. I am 100% with you Fr. McD, I think it really, really is unfair that the Ordinarites get a extremely more superior missal to those of us in the Latin Rite which should already have been given this. In your opinion, how long do you think, hypothetically, until we in the Latin Rite get this? I am going to purchase this Missal. I believe many bishops and priests will also purchase it. Once many bishops and priests in the OF. See this, they will see what Vatican II truly hoped to accomplish. The current OF is a transitional Missal and will be completely suppressed in favor of this Missal. I feel that America (USA AND CANADA,, English speaking) are a part of the Anglican Tradition and should be able to use the Thees and Thou's and old English--it's our patrimony in English too-- just look at many of the old laity hand missal so and the English used. Yes Cardinal Sarah well knows that the normal OF Missal must be as superior as theirs Divine Worshio, the Missal. All that is needed for our use is the elimination of the peculiarly Anglican customs, nothing else! I would say in the next 4 or 5 years! What's the problem Father? Use that missal if you want to. After all every other priest does whatever he wants at Mass. What is stopping you. The bishop won't do anything. I have never once, in my entire life attended a Mass where the priest didn't change, alter, add or omit something. Go ahead do it. What do liturgical norms matter anyway. Hasn't Pope Francis shown us that they can be broken at will? He did it as archbishop when he didn't have the authority to change anything and he is still doing it. He said go make a mess. Go ahead. Start messing things up. I want to see how many priests start using that missal and watch just how fast those bishops will clamp down on them. A priest could wear a clown outfit and the bishop will remain silent. But just dare to offer Mass in a dignified manner and towards the East and see what happens. It's laughable. The Church has become a joke. The Roman Rite has been so bastardized that you are longing for a pseudo Anglican rite of Mass. And the Jews don't have to recognize Christ as Saviour and the papal preacher is praising heresy. But all is well. I believe that stout resistance would form should an attempt be made to suppress the OF Missal. While "we" may agree that the new Anglican Ordinariate Missal is superior to the OF Missal, many Catholics (clergy, religious, and laity) do not agree with us. They insist that the OF is THE Mass to end all Masses. They insist that the OF is superior to the TLM. As they believe that the OF is superior to the EF, why would they accept that the Anglican Ordinariate Missal is superior to the OF? Therefore, Father McDonald, why would they accept (at least without a fight) an Anglican Ordinariate-style Missal (that eliminated "peculiarly Anglican customs" while having introduced EF features)? I could produce numerous declarations from leading Churchmen in the United States who insist that the OF is superior to the EF. Archbishop Cupich has declared that in the "old Mass", people are "reduced to passive attendance as silent spectators...the transforming power of the Eucharist was not the source of their spiritual lives...."old" Mass was incomprehensible to the "common" person...many rites from the "old" liturgy were incomprehensible as they reflected European court practices...TLM inspires the separation of the Faithful from the altar via literal barriers (altar rails). Conversely, according to Archbishop Cupich, the OF is designed to allow people to gather around the altar. New designs of churches during the post-Vatican II years have enhanced the liturgical lives of Catholics. Archbishop Chaput has declared of the EF that he does not "personally prefer it, in fact I find the Novus Ordo, properly celebrated, a much richer expression of worship..."
To his credit, Archbishop Chaput has said that "we need access to all of the Church’s heritage of prayer and faith." However, he has again insisted that the Novus Ordo (compared to the EF) when celebrated "properly", is "a much richer expression of worship." Why would such Churchmen (and millions of Catholics who favor the OF as is) accept the argument that the current OF Missal must be tossed aside in favor of a new EF/Anglican Ordinariate-flavored OF Missal? Anonymous said..."I have never once, in my entire life attended a Mass where the priest didn't change, alter, add or omit something. Go ahead do it. What do liturgical norms matter anyway." An elderly Monsignor, very acute mentally, raised for the first 30 years of his life in the "old" Church and Mass, has been placed in charge temporarily of a nearby Novus Ordo parish. I have assisted at a couple of Masses. He alters dramatically the text of the Mass. He is typical (with few exceptions) of the priests (young and old) in my diocese in that he presents Vatican II as a break with the Church's past...and believes that to be good. He, and virtually each priest in my diocese (at least the priests I know), always talk about Traditional liturgical/spiritual practices as being in the past...overthrown. We have a TLM-only (FSSP) parish in our diocese, but priests will say..."We used to offer Mass in Latin, but the Church ended that decades ago. We used to offer Mass with everybody facing East, but that ended long ago. We used to kneel to receive Communion on the tongue, but the Church has moved on from that." Bishops and priests with that mindset will accept a new EF/Anglican Ordinariate-style OF Missal? They will restore their ugly, wreckovated churches to reflect the liturgical grandeur of the new New Missal? I hope. But...really? They will? Is it available in Latin? The official language of the Church? I believe that Robert Cardinal Sarah, particularly as Pope, could lead the way to the restoration of liturgical peace within the (Latin) Church. But I believe that the way to liturgical peace begins with the example set by the Pope. Suppose that God grants His Holiness Pope Francis many more years. Beginning now (as the case would be with any Pope), His Holiness must begin to promote in major fashion the Latin Church's tremendous liturgical tradition. Offering the TLM publicly (at least several times a year). He must pave the way for the return of the EF and EF additions to the life of the Latin Church. During the past 50+ years, our Churchmen (a great many) have attacked the TLM. They have been joined by liturgical "experts" who have taught the Faithful to despise the TLM. For decades, we have been told that the TLM is "incomprehensible"...ad orientem worship means that Father's "back is to us"...the TLM renders us as mere "silent spectators"...the TLM mentality gave us church architecture (such as altar rails) that "separates the laity from the altar." Holy Communion received while kneeling is dreadful. Latin is dreadful. Modern liturgical music is grand. Gregorian Chant is dreadful. The lengthy Roman Canon is dreadful...EP II is fantastic. That is the 50+ year mentality that the liturgical peacemakers must deal with and overcome. That won't be easy. 1. The Latin Church is mired in a liturgical crisis. 2. The way out of said crisis begins with us turning to the TLM to inform our minds and hearts. Is Pope Francis willing to go that route? Otherwise, about all that we will receive is the addition of some EF options that the majority of bishops and priests will resist and ignore. The majority of bishops and priests have, in many ways, treated Summorum Pontificum as a dead letter. Why would they welcome a new EF-flavored OF Missal? Interesting to compare the Propers for the 15th after Trinity (as shown in one of the photographs) with the BCP for that Sunday, the 14th and 15th after Pentecost in the Roman Rite, and the 21st per annum in the Novus Ordo. Most of it, including the Introit, are from the 15th after Pentecost, but the Collect and Postcommunion are taken from the 14th. This brings the Collect into line with Cranmer's in the BCP for Trinity 15. 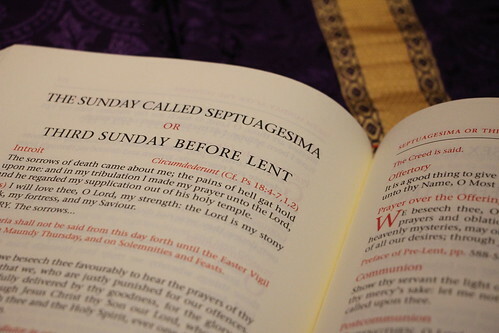 Septuagesima restores most of the Propers and includes a pre-Lent Preface which the Roman Rite does not have. The Collect, Epistle and Gospel are the same in the Roman Rite and the BCP, but since the Ordinariate has signed up for the 1970 Lectionary this happy coincidence cannot be replicated in the choice of Scripture readings. Or can it? It is clear that many of the key features of the Bugnini reforms have been explicitly or implicitly rejected, although some egregious novelties have been retained. I suspect that in England at least, where Ordinariate priests are particularly attached to the classic Roman Rite, they will say the 'silent' prayers in Latin, and a lot of the music, especially the chant, will be sung in Latin. I'll be interested to see the new Missal in use, although the Coverdale version of the psalm Judica me Deus sounds very strange to Catholic ears! Even with the OF missal as it is, a priest can certainly lead a recitation of the Foot prayers before Mass begins, offer votive Masses for the harvest on ember days, and otherwise celebrate the OF Mass in a manner very similar to this Ordinariate missal. 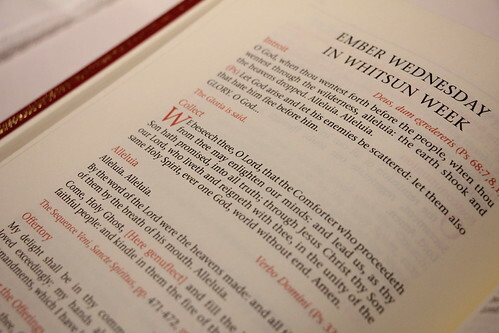 It should be noted that this missal is part of the liturgical tradition of the Latin Church. I have it on unimpeachable authority that there is on ongoing crackdown on those AU/Ordinariate priests who would dare to learn or celebrate the Extraordinary Form of the Roman Rite on the part of Steenson, Hurd, and Chalmers. The affected priests are naturally frightened, and unwilling to go on record, but make no mistake, the leadership of the U.S. Ordinariate at present has set itself against both Summorum Pontificum and Anglicanorum coetibus. I have it on good authority that this intimidation, an abuse of power, is being report[ed] directly to the Roman Authorities. And the contention that the traditional Latin Mass has no bearing on the Anglican Patrimony — this simply has me flabbergasted. Is there just a shortsightedness on the part of the Ordinary, or is he ignorant of the history of English Catholicism?" I also agree with Mark Thomas at 2.06 where he said that there would be stout resistance to any change to the OF missal. From what I know of those who attend the OF Mass they are right behind it except for the recent changes in translation many of whom don't like it. There are a few, like me, who attend because there is no other option at the moment but we are completely out numbered I would say probably by a 100:1 ratio. So I don't believe there will be any change in the Novus Ordo. In future I think the only ones who will attend a well offered, perhaps slightly tweaked Novus Ordo Mass will be those who belong to the Opus Dei because, as far as I can see, they are the only ones passing on the faith to their children who prefer the Ordinary Form of the Mass and who, I think, because they are a lay organization, like the involvement of the laity in the Mass. By and large, the Opus Dei resistant appear to be resistant to the TLM. I also agree with Mark Thomas at 2.06 where he said that there would be stout resistance to any change to the OF missal. From what I know of those who attend the OF Mass they are right behind it except for the recent changes in translation many of whom don't like it. There are a few, like me, who attend because there is no other option at the moment but we are completely out numbered I would say probably by a 100:1 ratio. So I don't believe there will be any change in the Novus Ordo. In future I think the only ones who will attend a well offered, perhaps slightly tweaked Novus Ordo Mass will be those who belong to the Opus Dei because, as far as I can see, they are the only ones passing on the faith to their children who prefer the Ordinary Form of the Mass and who, I think, because they are a lay organization, like the involvement of the laity in the Mass. By and large, we find the Opus Dei resistant to the TLM. Anonymous at 5:19 PM said..."From what I know of those who attend the OF Mass they are right behind it except for the recent changes in translation many of whom don't like it." That is a great point. Resistance to any change in the Novus Ordo is so strong that even the attempt to sacralize the prayers, to imbue the Novus Ordo with a degree of transcendent language, stirred great controversy throughout the Church. Grumbling and resistance to the translation has continued...and we should believe that we're dealing with people who would exercise and embrace EF "options" offered by a new EF-flavored OF Missal? No need to frighten the horses with talk of suppressing the current OF missal. A lot of the the EF patrimonial elements in the Ordinariate Missal could easily be added as an optional appendix to the OF Missal, along the lines indicated by Cardinal Sarah. This is a more organic progression than another radical liturgical makeover. I don't see the need to add anything from the EF Mass to the OF Mass. VCII rightly called for simplicity, it's just that instead we got irreverence. I'd say keep the simplicity, but bring back the reverence. I can see the liturgical path of the OF in its current, much too variable celebratory manifestation, eventually bending toward the ethos of the Vetus Ordo. The twain shall never meet of course, but with a Pope in place who is so inclined, it can be made so that there is more uniformity, consistency, propriety and reverence in the celebration of the Novus Ordo across the realm of the Church. That in itself would constitute a big step. Will the TLM over a long period of time eventually displace the NO? Anything is possible, but for now, for the largest number of Catholics, the Novus Ordo is all they will ever attend and assist at. You have that beautiful Church. Most of us priests have nothing like that. Why then are you jealous? @Jan : I am a priest of the Ordinariate of OLW and welcome the New Missal. However I can see no opposition to the EF in the Ordinatiate or local Diocese here. I celebrate the EF on a regular Sunday basis in the Cathedral parish as part of the regular parish programme. Jan, one of our more distinguished Ordinariate priests celebrates the EF when the regular priest is unavailable. I am not aware of any controversy, but I'm not that well-informed. As for your question, the Ordinariate's Divine Worship, at least as I've experienced it, does have a large number of congregational responses. But these are often in the form of prayers in Tudor English, and the whole focus is on our sinfulness and unworthiness, rather than on self-celebration. we pray the "Lord, I am not worthy..." three times, for instance. I find the participation helpful, rather than a hindrance as it so often is in the Novus Ordo. But structurally, Divine Worship is far closer to the EF than the OF. Thank you, Doodler and Murray, that is good to hear. Given the opportunity I would certainly attend a Mass offered by the Ordinariate in preference to many of the Ordinary Form Masses available in my diocese. Forgive the brevity of this comment, as I am currently on a mobile device. I do not, at present, clearly recall the article from whence the quote above was extracted; however, I do remember the historical context quite well. Msgr. Steenson, then Ordinary, now Administrator of the Personal Ordinariate of the Chair of St. Peter, shortly after the erection of the Ordinariate and the incardination of its first priests, prohibited explicitly the celebration of Holy Mass according to the so-called Extraordinary Form of the Roman Rite on "Ordinariate premises" (or some words to this effect). This fact was confirmed by a priest on the Governing Council, and the Ordinary's edict was committed to writing. I may still be able to produce the original communication from the Ordinary for the record. Additionally, the Ordinary spoke contemptuously of the TLM generally during his first visit to Incarnation Catholic Church, my Ordinariate parish in Orlando, Florida, albeit within the larger context of a diatribe against the Society of St. Pius X (which has a priory in nearby Sanford), which he declared to be "schismatic" ... "not in communion with the Holy See and the local bishop." I can only hope that time and experience have tempered Msgr. Steenson's very strong negative perception of the Usus Antiquior. I have great respect for him as a pastor, but he was gravely misinformed about Catholic Tradition, at least when he took the helm. I would be very pleased indeed to learn of the public celebration of the TLM in any Ordinariate church. Ah, that explains it. When one of our local Ordinariate priests celebrates the Latin Mass, he does so in another parish, not his own. Thanks for the background. Let's hope that the new bishop is more friendly to Catholic tradition.